Unfortunately the "Disney Minnie Beauty Sephora Giveaway" offer is no longer available. 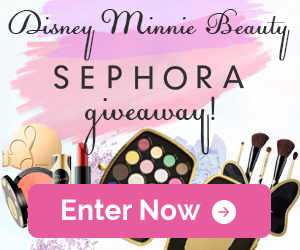 There are 25 Disney Minnie Beauty shimmer eyeshadow pallets up for grabs in this Disney Minnie Beauty Sephora Giveaway! These creamy eyeshadows offer super pigmentation. This pallet consists of neutrals and pops of color. The palette can be removed from the clutch, making the clutch usable long after the eye shadow is gone. Giveaway ends 5/20/17.